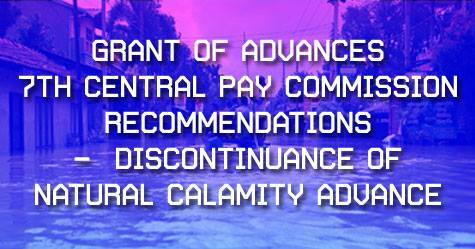 Grant of Advances - Seventh Central Pay Commission recommendations - Discontinuance of Natural Calamity Advance. Sub: Grant of Advances - Seventh Central Pay Commission recommendations - Discontinuance of Natural Calamity Advance. The Seventh Central Pay Commission vide Para 9.1.4 had recommended that all the interest-free advances being granted to the Central Government employees should be abolished. The Government's decision in this regard has been conveyed by the Ministry of Finance vide their OM No.12(1)E.II(A)/2016 dated 07.10.2016. According to the instructions contained therein, the Natural Calamity Advance in addition to six other advances has been abolished. 2.The Government's decision in respect of abolition of advance of Natural Calamity Advance has been considered by the Ministry of Railways in consultation with Finance Directorate. It has been decided to abolish Natural Calamity advance w.e.f. 07.10.2016. The cases where the advances have already been sanctioned need not be reopened.